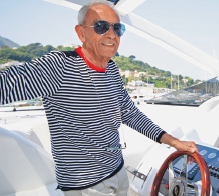 Check out this testimonial from Gianni Cacace about being a part of the Magnum family his passion for Magnum Marine boats! I participated with great pleasure in the Magnum 45th Anniversary Rendez-Vous organized in June 2011 by our friend Giancarlo Cangiano in Ischia; and it is also with great pleasure that I take this occasion to write some brief reflections on Magnum Marine and its beautiful creatures, to be inserted in the book which you are preparing meticulously with the same passion with which you have always built boats. Personally, I believe to be the most evident proof of brand faithfulness because, since the first meeting with dear Filippo in 1977 and until today, I have always been the owner of one of your boats: first the 53’, then the 63’, the 70’, and now the 80’. This proves how much I have always appreciated your work and your products that combine innate beauty, class, and performance with the most important qualities for those who go out at sea: strength, complete safety, and reliability. Without these qualities, I wish to underline, it would not have been so natural to bring aboard all our children; indeed, from the day they were born, my grandchildren have always cruised with us, in comfort and absolute safety. This feeling of safety and reliability has always been felt not only by me, but by all those who have come on board. In fact, it is evident that everyone who comes on board immediately feels at ease, relaxed and safe; Magnums give you this feeling, independently of their size. Needless to say, on board the Magnum I have had the best moments of relaxation with friends and family. That is why I am grateful to own a Magnum. Owning a Magnum means belonging to a larger family of those who love and understand the sea; it is a pleasure to be together and to meet with other Magnum owners, and I look forward to our next rendez-vous.